Some of these happen weekly, so come Friday the intake of sugar and processed foods has been horrendous. Then they still want treats on the weekend. When has it become “normal” to feed our kids such damaging foods on such a regular basis? And very often without parental permission. Children need our help to be and stay healthy. We need to stop normalising this constant giving of treats at every opportunity. Any excuse to celebrate and we seem to do it with junk food. Sugar, preservatives, artificial flavourings, msg, tartrazine, colourants, trans fats – it needs to stop. All these things damage health, rot teeth, cause weight problems as well as health, behaviour and learning issues. but I also don’t believe that they need them every day. I am never one to rant and rave without thinking of solutions. So I sat down and listed all the things I can do to help change this situation. I am hoping that some of this will resonate with you too, so together we can begin to define a new norm – one mommy at a time! Scour the internet for recipes and experiment with making treats that are more natural and less processed. Focus on quality and not quantity, e.g., dark chocolate instead of candy-coated, sugary rubbish. Lovingly encourage family members to stop feeding my kids junk. Set a good example in our home and when out and about with others. To get creative and find other ways to treat my kids, e.g., quality time with them, small toys, stickers, outings, pens and crayons, games, colouring in books, new clothes etc. To ban party packs forever! Balloons work just as well as the obligatory “junk to go”. Not to keep junk food in the house. If it’s just not there, it is just NOT an option. Explain to my kids that a lack of junk food is not to punish them but to help them be smarter and healthier. 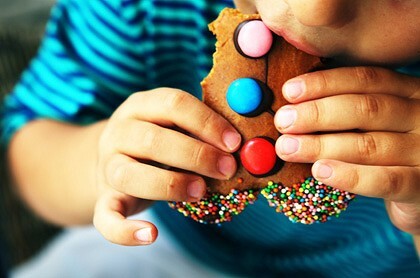 Don’t bribe my kids with sweets – find something else for this task. Don’t reward my kids with sweets. Rather hug them and tell them how proud of them I am. This Easter, I am going to focus my children’s attention on the true meaning of this holy christian holiday – and limit the number of Easter eggs hidden in the garden by the Easter Bunny. I accept that I won’t always get it right. But hey, at least I am going to try. What about you? Posted on March 26, 2013, in Primal kids and tagged Easter, junk food, treats. Bookmark the permalink. 5 Comments. My kids are allowed a little of something sweet each day….don’t do sweets to be honest…bite size choccies….it seems to have stopped them gorging on junk when they are not with Iain or I. If they have had enough they stop eating which I am sooo happy about. One of my friends kid eats until she is sick because they have been really restrictive with “treats”…..
My girls drink water or milk (Keira) and vary rarely drink juice and don’t drink fizzy drinks. I do not add sugar to anything they eat and avoid sugary cereals. They both do lots of exercise and I think have a balanced diet. Both are aware (especially Nieve 7) of healthier options. I’m trying to instil in them a bit of self control so that when it comes to parties they don’t over eat because they don’t know when they’ll get a “treat” again. Well done, sounds like you are doing a really awesome job with them. Thanks so much for sharing. I second this. I’m on this mission for myself and my kid to educate ourselves together about healthy options and not. And why it is not. He’s learning very fast. It helps that he goes to a school who also value healthy food very high and don’t allow anything sweet in lunch boxes. It was him who made me stop and realise, if I don’t set a good example he won’t be able to follow. So I made him an accomplice in figuring out what healthy eating means. Last Saturday we cooked together – he chopped veggies, including one we both never cooked before. It was fun, we didn’t know what it will taste like but it was yummie. Because he was involved in the making there was no issue at all with eating it. And when he wants something sweet I offer a banana. I’ve noticed that we both crave sugary sweets when we didn’t eat enough vegetables and fruits. It’s not always an easy journey but it’s very worthwhile! I know that grandparents are perennial transgressors – all we can promise is to try harder. Thanks Dad, that is why I love you so much.